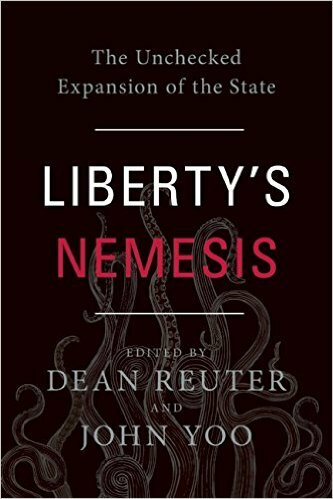 FIRE President and CEO Greg Lukianoff and Director of Policy Research Samantha Harris have penned a chapter of one of Amazon’s top-selling new public policy books, Liberty’s Nemesis, which comes out tomorrow. [OCR] has shifted from a focus on overt sexual and racial discrimination to the adoption and enforcement of a “hostile environment” theory that has led to significant restrictions on free speech on campus. While this expansion began in the 1990s, OCR’s overreach has dramatically accelerated under the Obama Administration, most notably since 2010. Over the past five years, OCR has ignored the Administrative Procedure Act (APA), investigated scores of colleges, given itself new and imagined powers, and has made it essentially impossible for universities to comply with its new decrees. Throughout all of these initiatives, OCR has encouraged the policing of speech and a reduction in due process for accused students. Greg and Sam provide a brief history of Title IX since 1972, as well as an accounting of its aggressive enforcement since 2010. We have reported extensively on OCR’s overreach— particularly 2011’s “Dear Colleague” letter and 2013’s federal “blueprint” (with its “breathtakingly broad definition of sexual harassment”) for addressing sexual misconduct on campuses—here on The Torch. The “Dear Colleague” letter has been routinely and strictly enforced as law, despite the fact that the regulations should not be binding under Federal law. OCR’s lack of clarity about the enforceability of the blueprint has been frustrating, leaving many schools enforcing the regulations for fear of running afoul of them. Greg and Sam cite shocking examples from the FIRE annals to show the chilling effect these regulations have had on campuses nationwide. At nearly 600 pages, and including contributions from other notables like NYU School of Law professor Richard Epstein, legal commentator and law professor Jonathan Adler, and Senator Orrin Hatch, it’s definitely a meaty and interesting read! You can pre-order a copy from Amazon today, or check it out at your local bookstore when it’s released tomorrow.